Transmitting the newest images and the most exciting news to the people at any time, anywhere and as fast as possible – that’s an absolute must in the news industry. No matter if it is radio or TV, live images and original sound need to arrive at the customer without delay and in excellent quality in order to evoke emotions and the right vibes. Steady and fast connections are essential, also in the field. More and more technical challenges are to be mastered to meet the requirements of first class signal transmission quality from the recording equipment to the end user. 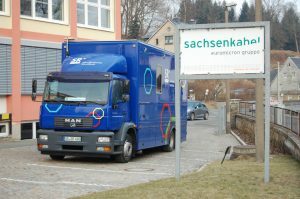 This was the challenge for “Saarländischer Rundfunk”: The multi-fiber connectors used previously to transmit data were based on ferrules. Hence, they were not suited for harsh environments. The link to other self-owned broadcast vehicles and those of other radio companies was very hard to realize, as most outside broadcast vehicles are equipped with expanded beam technology. It turned out that the existing system had to be converted to Eurolens expanded beam connectors and Eurolens Bulkheads, in order to ensure system compatibility. The expansion of the light beam provides much better tolerance for minor pollution and vibration making the connectors better suited for harsh environments. The Radio Broadcast Company brought on board an experienced provider of fiberoptic cabling solutions, LWL-Sachsenkabel GmbH, who have successfully realized similar projects. The two partners established their first contact on the prolight+sound 2017 trade show, when the broadcast station Saarländischer Rundfunk asked Sachsenkabel for help with their problem. We have mastered the challenges and refitted the outside broadcast vehicle on time and with excellent quality. Due to transparent project planning and careful preparation, everything worked without any issues. After a very positive feedback, we are still in contact with the broadcasting station and are looking forward to supporting them in other projects.